As our friends in Credence once said, "Who'll stop the rain?" March and April have been exciting times for Fulton. Our new brewery in Northeast Minneapolis has transformed from a shell of a warehouse filled with construction debris to looking like a bona fide brewery. While there is still plenty of work to complete before the first cases of Sweet Child of Vine roll off our bottling line, that day is finally visible on the horizon. Until then, take a quick virtual tour of the new digs. Starting this week, all you beer lovers throughout Central Minnesota will finally find Fulton a little closer to home -- or the cabin, as it may be. We've partnered with C&L Distributing to bring Sweet Child of Vine, Lonely Blonde, The Ringer, and more to your local watering hole. The first few months will be draft only, and later this year as our new brewery comes online, bottles will be coming as well. We'll be travelling through the area all summer doing release events and special tappings, so if you see us out, come say hi and we'll buy you a beer. May 10th is just around the corner! The first ever Fulton Gran Fondo is two Saturdays away. If you enjoy bikes, beers, bands--or all of the above--you should be here. If you're up for the 100 mile bike ride, be sure to register ahead of time, and be here ahead of the 9:00 start time. The block party starts at 2:00 and goes til 8:00. You'll have the chance to enjoy live music from four bands and eats from three food trucks, and to cheer on the bikers as they return from their century ride. The party's free and it's the first chance to try our new summer seasonal, The Randonneur, so there's no excuse not to be here. 2 GARAGE SERIES BEERS OUT THIS WEEK! 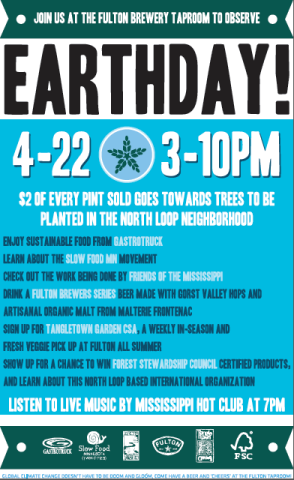 PLUS, JOIN US AT THE TAPROOM TODAY TO CELERBATE EARTH DAY. Also, you're invited to our new brewery in NE Minneapolis on May 10th for the Fulton Gran Fondo. Maitrise (“May-treese”; translates from French as “expertise” or “mastery”) is a new world imperial farmhouse ale crafted as a tribute to the creativity, dedication, and ingenuity required by the profession of brewing. As a truly original blend of American & German wheat & barley malts, New Zealand’s Nelson Sauvin hops, and French saison yeast, Maitrise defies classification and convention. It’s an unexpected 9.5% ABV and 80 IBU, brilliant with tropical fruit, yet balanced with a tart palate that finishes soft and dry. Maitrise is out at local draft accounts this week, and will be launching at the taproom ($5/12 oz pour; $18 growlers) on Saturday at noon. As with all Garage Series releases, it will only be around for a short time. Making its second Garage Series appearance, MPLS Mild returned this year with a new name, modified recipe, and the same all-day drinkability of last year's version. Now nearly a forgotten style, Mild ale originates from England, where less than a century ago it represented the majority of beer brewed there. At 4.0% ABV, MPLS Mild is the definition of a session beer. Six grains, including flaked oats and Britain’s prized Maris Otter, lend it a garnet brown color, silky mouthfeel and surprisingly substantial body. 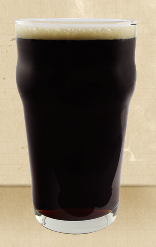 The Mild greets your palate with a subtle interplay of nutty, roasty, and toffee malt character. It’s so easy to drink, you’ll soon find yourself ordering another, and another – if our brewers haven’t finished it all already. MPLS Mild is available now through May in pints ($4) and growlers ($10) in the taproom, as well as on draft in select metro accounts. Today is Earth Day! We're opening the taproom at 3:00, and $2 of every pint sold today will go towards planting trees in the North Loop neighborhood this summer! You can eat Gastrotruck; listen to Mississippi Hot Club; sign up for a Tangletown Gardens CSA; and learn about some local organizations doing great work - Forest Stewardship Council (FSC), Friends of the Mississippi River, and Slow Food USA. We will also tap a very limited Brewers Series Beer made with Gorst Valley Hops and organic malt from Malterie Frontenac. See you there! JOIN US MAY 10TH FOR THE FULTON GRAN FONDO! Like bikes, bands, and beers? Then save May 10th on your calendar for the Fulton Gran Fondo, a 100 mile bike ride and block party presented by Blood Sweat Chemo, Inc at our new brewery in NE Minneapolis. If you're up for several hours in the saddle, the 100 mile ride departs at 9 AM from the new brewery. It's a spirited ride, not a race, so regardless of your compeitive disposition, it will be fun. The $25 registration gets you into the ride, a t-shirt, a commemorative pint glass, and 2 beers at the block party as well. The block party runs from 2:00 to 8:00 pm, and is free & open to all. There will be $5 beers all day, including the first tapping of The Randonneur, our all-new Summer Saison, and food truck offerings from Get Sauced, MidNord Empanda, and Cafe Racer. Live music will be provided by All Tomorrow's Petty, Tramps Like Us, Wangs, & Drew Peterson and the Dead Pigeons. The Fulton Gran Fondo is an event by Blood Sweat Chemo, and all proceeds that BSC raises will go to benefit the Minnesota Cycling Center, an upcoming NE Minneapolis cycle racing and education hub built to serve cyclists of all stripes and function as a multi-purpose event center. Check out theirwebsite to learn more about the Center and how to help make their vision a reality for Northeast Minneapolis.